A discipline focusing in the utilization of one's body to physically overcome obstacles in the most efficient way possible. This. It gets the point across well. I want to be clear about something first, I mean this as a genuine question. What do we as a community mean when we say "...the most efficient way possible."? Parkour is the art of moving through the environment around you (railings, walls, trees, buildings, and anything else) in a safe, fast, and efficient manner. One learns how to overcome any obstacle in their way, by either going over it, through it, or even under it. Parkour is a physical discipline. Although it may seem dangerous, if practiced properly great improvements can be made with no to little injury (bruises and cuts). Just like any Martial Arts, Parkour requires concentration, dedication, and most of all discipline. Without these, the dangers of Parkour are very real. I like cementandsteel's definition. It describes what it's really about. Mine is kind of scary with the dangers and whatnot. But I'm just throwing ideas out there. Parkour is Variable... Defining what it is and is not is difficult because of each person's own take on the philosophy. But there are a few things held in common with all definitions... Parkour is movement. To put it in more specific terms, it is using the vast repertoire of movement potential available to the human body as a means of conditioning ourselves to eliminate the ideal of obstacles. Parkour is not about mastering moves, but rather, mastering oneself and our reclaiming our ancestral adaptability. Parkour is not singular and set in stone. It is not about competition or exhibition. It is being better than you were two weeks ago. It is about movement that is smooth and pure. It is physically and mentally demanding. And above all, Parkour is as much of idea as it is a word. Very understandable inquiry, but as for the car part etc. remember that it stated using the body to get past an obstacle "in the most efficient way possible". But i do understand the debate over the word efficient, you are right. That can vary based on factors though, the definition of efficient is "1 : being or involving the immediate agent in producing an effect 2 : productive of desired effects; especially : productive without waste". So basically producing the desired effect to get over the obstacle immediately could be defined as being efficient in the definition of parkour that i stated. Hopefully that can clear things up a bit. Parkour is about freedom of movement by not being restricted to inefficient, pre-determined paths from point A to point B. It's about training body and mind to overcome both physical and mental obstacles. It's about learning to control the body, and getting all its parts to work together. Parkour gives mental clarity and focus, self-discipline, confidence, and the ability to deal with fear. All these things can be carried into daily use outside of a Parkour environment, from work, to school, to simple home life. Parkour is a system of movement for overcoming obstacles in the physical environment using only the capabilities of the human mind and body to move from one place to another. Parkour is a syncretic and holistic discipline that allows its practitioners to incorporate both standardized techniques (such as kong vaults, precision jumps and catleaps), as well as non-standard and unnameable hybrid or novel movements. It can be practiced in a wide range of environments, or perhaps any environment, including natural and man-made settings. Generally parkour is said to focus on efficiency, which differentiates it from freerunning, which includes a focus on aesthetics, personal expression, or both as well as efficiency. However, there are many practitioners who make little or no distinction between parkour and freerunning. Efficiency can be defined in many ways, including speed, reduction of impact on joints, and minimization of physical effort required to quickly pass obstacles. Hey everyone. I wrote the current posted definition, so I'd like to get some input about which parts you all like and do not like. Parkour is an art of movement in which you train the body and mind to overcome obstacles. A parkour practitioner, called a traceur (male) or traceuse (female), uses their surroundings to improve their ability to move in space. By interacting with obstacles, be they urban architecture or the natural environment, the practitioner becomes more comfortable controlling his body and navigating any terrain. The meat of parkour is the discipline of daily training, physical and technical, to heighten the bodyâ€™s natural movement elements such as strength, speed, balance, coordination, precision, power, and endurance. The application of parkour is efficient traversal when circumstance necessitates it, such as being chased, or needing to reach a destination. While this is the practical application of the training, one could do parkour their entire lives and not ever have to use it in this way, similar to a martial artist never getting into a fight. Though it may never have to be utilized in this way, the benefits of parkour are far reaching. Being that parkour is made up of a lot of movements that are natural to the human animal, the body is strengthened evenly and synergistically, meaning all the parts of the body learn to work together. This helps to balance the body and improve all movement in general. Aside from the physical benefits, many people find training parkour develops mental clarity, confidence, self-discipline, the ability to deal with fear, and many other mental gains. Parkour is an art that helps you overcome obstacles as quickly and efficiently as possible, using only the abilities of the human body. Movements should be guided by an intent to escape and/or reach; if a movement is superfluous to that intent, it is not typically considered parkour. Parkour movements often involve running, jumping, vaulting, quadrupedal movement, climbing and balancing. Freerunning is a related discipline that focuses on aesthetics, elegance, and freedom of movement. Freerunning movements can be similar to parkour's, but may also include flips, spins and other acrobatic maneuvers. Parkour and Freerunning are often compared and contrasted with each other, but ultimately have a common ground in one's flowing through an environment while harmonizing with the obstacles, control of one's movements, and the athleticism, training and conditioning required to practice the "art of movement" safely. In the classes I teach and the Seminars I host, I use this expression, as I feel it conveys the physical aspect of the form as well as the mindset we take on, which is equally important. But it's all done in a quick sentence. Parkour is an art form that trains the body to overcome physical obstacles and teaches the mind to overcome fear and hesitation. Replace "I can't" with "I am challenged with". Parkour is what you do every day. Getting from one place to another, in any way we can. Running up walls, vaulting over rails, and jumping huge distances aren't necessary. All that is necessary is you. You... and the world. Parkour is using the human body to overcome obstacles, and to enjoy oneself in the process. I really like it Travis. I think it includes many important aspects of defining parkour: it talks about what we do physically, emphasized that it's natural movement, talks about efficiency, non-physical aspects and benefits, and discipline. Parkour is a syncretic and holistic discipline that allows its practitioners to incorporate both standardized techniques (such as kong vaults, precision jumps and catleaps), as well as non-standard and unnameable hybrid or novel movements. Your definition includes that we use the environment, which is a great point that I forgot to address. ::shrugs:: I'm not sure. I see the argument just fine, but without numbers to back it up I am not quite convinced that it's more efficient to go over something instead of around. (In an energy producing, calorie burning sort of way.) This hasn't stopped me from practicing, just some thoughts I have during the day. For me parkour can be lots of things, I don't think there is a definition for parkour... I think parkour is the definition. Hehe, sorry about the circular reasoning there, but it kinda makes sense huh? Parkour is the discipline of efficient movement using the human body to surpass obstacles in a swift, controlled, and fluid manner. It usually consists of vaults, jumps, rolls, climbs, balances, and running. A practitioner of Parkour is known as a â€˜traceurâ€™ [male] or a 'traceuse' [female], which loosely translates from French as â€˜one who goes fast.â€™ It was created by David Belle, a Frenchman, who developed the discipline as an adolescent living in a suburb of Paris. Parkour, spreading rapidly throughout the US, is garnering more and more novice traceurs through YouTube videos, online forums, and local and national news media. i dont like real pics. They steal ur SOUL! I am the prophet nemesis. Guardian of the Nexus and void. God of death. Parkour is a discipline in which one attempts to move throughout their environment in a quick and efficient way. Parkour is not flipping and other acrobatics, that constitutes as free running. Other names that are generally confused with Parkour and free running would be russian climbing, 3run, etc. Parkour is not jumping off high areas senselessly. It is a constructive (and at the very least will simply be lowered to neutral, neither constructive nor destructive). But most of all, Parkour is fun! Parkour is a movement art incorporating fast and efficient movement through man-made and natural spaces. Fluid, controlled movement with little wasted energy is highly valued by the parkour practitioner ("traceur" for males, "traceuse" for females). Parkour is typically characterized by, but doesn't require, non-standard use of objects to create an alternate path. Though parkour doesn't require non-standard use of a space, it is often what the parkour practitioner seeks out when training. Though primarily a movement discipline, parkour also requires creative-thinking skills. A traceur or traceuse must remove the cultural context and expected use of objects in his or her environment in order to find new paths through the space using those objects. This is commonly called "parkour vision", and is an integral part of the parkour experience. Freerunning, a similar discipline not easy to distinguish from parkour by an inexperienced observer, is closely related to parkour but its practitioners have a different intent in their movements. 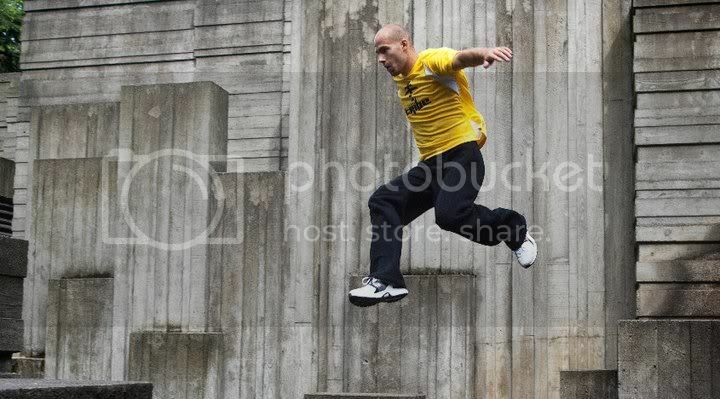 The goal of freerunning is more aesthetics and expression. Freerunners often start with a base of parkour skills and add acrobatics or dance to their moves. Freerunning and parkour are culturally similar, have a lot of cross-over skills, and often share web resources (such as forums) and training sessions.